Comparative and semi-quantitative proteomics using Two-Dimensional Difference In-Gel Electrophoresis (2D-DIGE) Technology. ITSI-Biosciences utilizes validated sample preparation kits/protocols, robotic spot pickers/digesters, DeCyder difference-in-gel analysis software and advanced mass spectrometers to offer an integrated 2D-DIGE – MS/MS proteomics solution. Proteomic analysis usually starts from sample preparation, to analyses by mass spectrometry (LC-MS/MS) and protein identification and annotation. Data obtained after 2D-DIGE analysis may include protein identity, pI, molecular weight and post translational modifications. 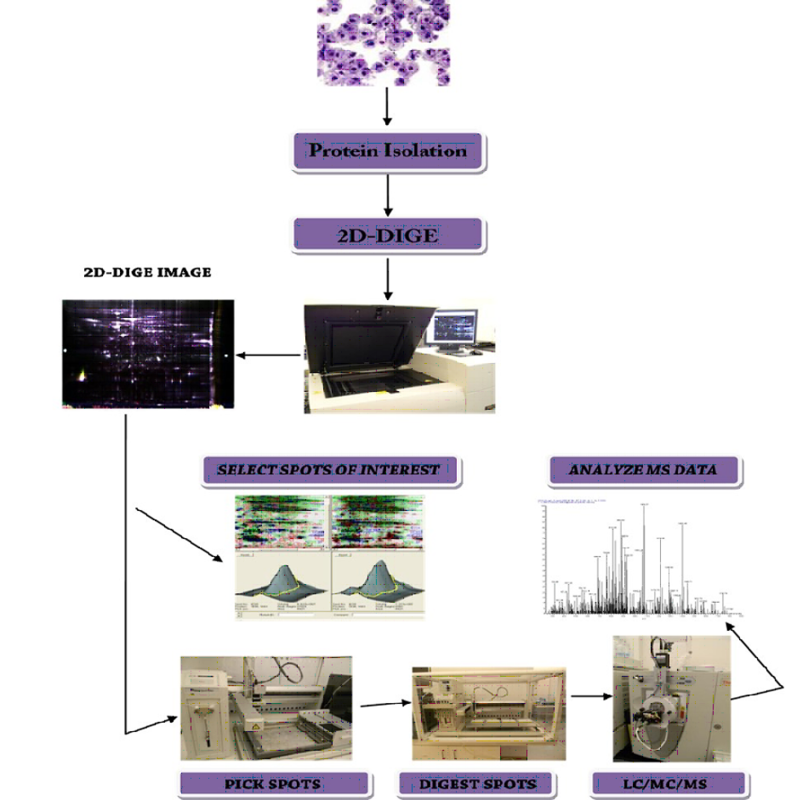 ITSI-Biosciences has provided 2D-DIGE analysis and proteomics services to NIH, industry, biotechnology companies, pharmaceutical companies, Research Institutes and Universities. 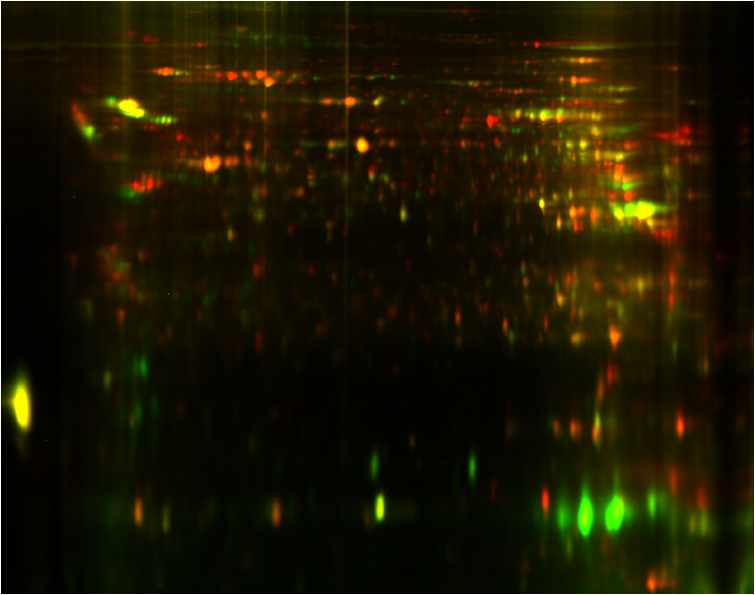 Our more than 15 years of experience with 2D-DIGE analysis, proteomics, mass spectrometry and protein expression profiling enables us to offer reproducible picture perfect gels at a competitive price and guaranteed faster turnaround time. We have also developed a variety of complementary 2D-DIGE kits to streamline and standardize protein isolation, protein quantitation, protein qualification and the 2D-DIGE analysis step, thereby reducing the overall time and cost of performing 2D-DIGE analysis. 2D-DIGE offers all the advantages of the classical 2D-PAGE, and most importantly overcomes the inherent disadvantage of gel-to-gel variation and reproducibility problem inherent with the traditional 2D-PAGE approach. 2D-DIGE is presently the most versatile gel-based approach for comparative and semi-quantitative proteomics. Distinct fluorescent tags e.g. Cy 3, 5 and 2 are used to label protein samples and a universal internal standard prior to 1st/2nd dimension electrophoresis. An automated software program is used to detect, quantify and annotate differentially expressed proteins. 2D-DIGE analysis can be applied to protein expression profiling and comparative proteomics by using DeCyder software to identify proteins with statistically-significant difference in expression. This provides unique opportunities for researches in fields including cancer, neuroscience, vision, cardiovascular, Alzheimer, Parkinson, etc, to find important proteins associated with the condition. 2D-DIGE – LC/MS/MS analysis can also be applied to identify post translationally modified proteins (PTM) that are important in cell signaling and protein trafficking. Our 2D-DIGE based comparative proteomics services includes, experimental design, Sample preparation to isolate total proteins using ToPI-DIGE protein isolation Kit, pre-fractionation, quantitation and qualification of proteins, 2D-DIGE analysis, scanning of gels using a Typhoon DIGE-enabled digital scanner, Biological Variation Analysis (BVA) of spots detected to identify differentially expressed proteins with statistically significant difference, robotic spot picking of candidate proteins, robotic in-gel digestion of candidate proteins with trypsin or another enzyme. The enzyme digested proteins are identified by Tandem Mass Spectrometry and annotated. Biological variation analysis of gel images to identify differentially expressed proteins with statistically significant difference. Identified protein annotation – 60 min run.